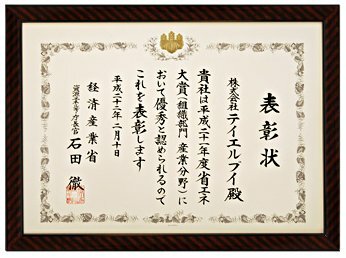 The following awards are given by Japan’s Ministry of Economy, Trade and Industry to individuals and organizations producing machines and systems that have gained recognition for their contributions to the promotion of energy savings. In the past, the awards were given only for consumer machines and systems. However, from 2009 onwards this was expanded to include industrial applications as well, in addition to individuals and organizations. TLV is a recipient of one of these prestigious awards, the Director General's Award for Japan's Agency of Natural Resources and Energy, through a joint application with the Nippon Petroleum Refining Co., Ltd. of the Nippon Oil Group. The joint effort consisted of implementation of TLV's BPSTM (Best Practice of Steam Trap Management = management of condensate discharged locations) program, which focuses on how to manage large numbers of steam traps effectively and with continuity. This program was implemented at the Kashima Oil Refinery, and is now employed by many customers. In the future, we hope to have the opportunity to pay you a visit with proposals for our program to provide you with energy savings, reduced CO2 emissions, and contributions to increased safety and stability of operations at your plant. For further details, please visit the Energy Conservation Center, Japan web site.